We decided to go skiing for 4 days around New Year’s. It’s still very dark and the days are short, but we were sure it would be all right to ski in the dark. So we drove from Sodankylä to Saariselkä and Urho Kekkonen National Park. There are open huts and you can also reserve a spot for a small charge. We didn’t know, if it was a popular time to be out there and we wanted to sleep inside. So we reserved the sleeping places in advance and picked up the key from Kiilopää. 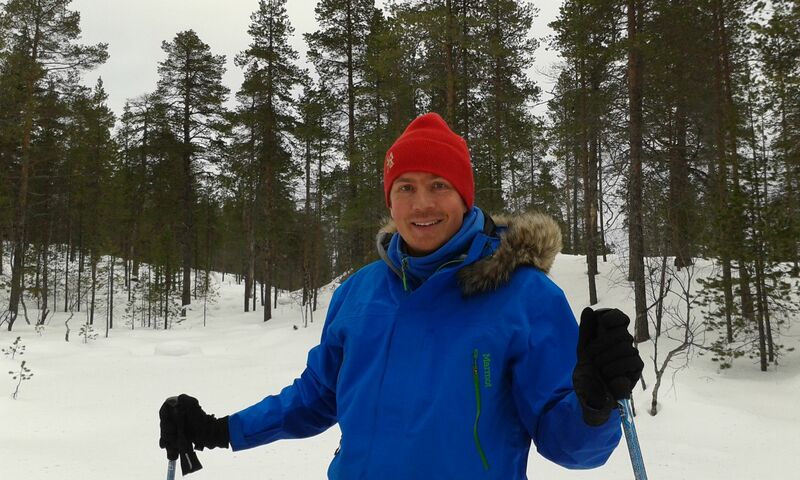 On the first day we skied for 14 kilometres to Suomunruoktu hut. We were the only ones there so we could have stayed at the open hut too. The next day we started climbing up towards Tuiskukuru hut, where we had lunch. This pictures is close to Vintilä fjell. It was beautiful up there with the trees covered in snow. Shortly after our lunch break it was already time to get the head torches out. We followed an old snowmobile track, which was still visible. It wasn’t too difficult to find our way in the dark. But it was a long day to Luirojärvi hut, about 23 kilometres. The open sauna for anyone to use was waiting for us thre and it was already warm as we arrived. A great way to relax and wash yourself after a long day of skiing. The weather was cloudy all the time, so we didn’t see any Northern Lights. But otherwise it was really nice, around -10 degrees Celsius. I like the light at this time of the year a lot. It is a special feeling being outside! The short days meant skiing in the dark every day. Going down hill is a bit more interesting especially, if it is a steeper and longer hill. A few times we just had to ski into the deep snow to stop our speed. We spent the third night back at Suomunruoktu hut. So 23 kilometres also on the third skiing day. On the last day it was just 14 kilometres back to the car. As you can see it was almost sunny. 🙂 This was the first time during the trip, when the sky was not completely covered. We saw some other people along the way, but it wasn’t crowded at all. About 75 kilometres of skiing in 4 days. The second day felt pretty tough, but the same route back on the third day felt much easier. Just more skiing, so the muscles get used to working again. It was a great trip and a great way to spend New Year’s.